1. Cut each apple quarter into 3 segments. Reserve. 2. In a blender, combine eggs, flour, milk, cinnamon, vanilla extract, sugar, and salt. Process on high speed for about 45 seconds. 3. 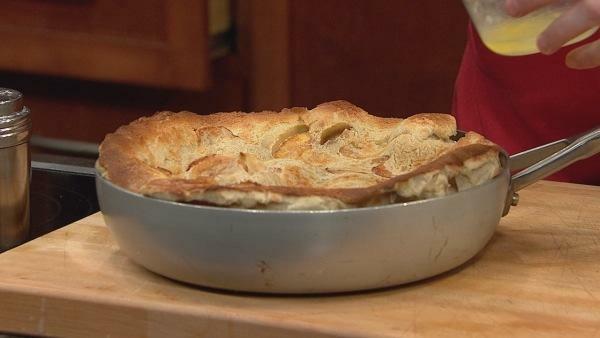 In a 12-14 inch straight-sided saut� pan over high heat, saut� apples in 6 Tablespoons butter. Add apple segments and saut� for 3 minutes or until browned. Flip segments over and continue to cook until the other side is browned and the apples are cooked through. 4. Pour in the batter from the blender. Immediately place the pan into a 425� F oven. Bake for 20-25 minutes or until the pancake has puffed and the top is well-browned. 5. Meanwhile, melt the remaining 2 Tablespoons of butter and reserve. 6. Remove pancake from oven, brush with melted butter, squeeze lemon juice over the top, and dust heavily with powdered sugar. Serve immediately and very hot. Once you cut into it or it starts to cool off, it will deflate.